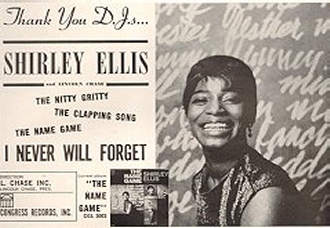 SHIRLEY ELLIS: she was funky yet classy, sophisticated but sassy. 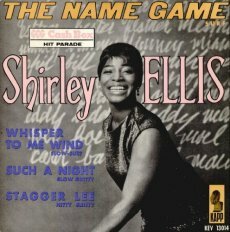 Unjustly pigeonholed as a novelty act by many rock historians, Shirley was a unique talent who could rock the joint with the best of 'em, then spin on a dime and hold a packed house of hip nightclubbers in the palm of her hand, spellbound by her cool mastery of a jazzy ballad. 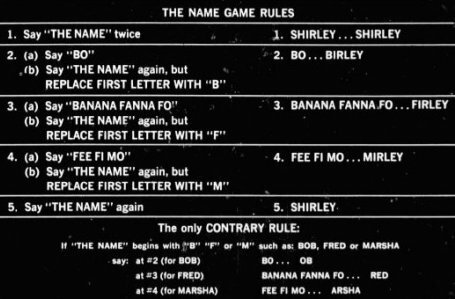 A clever songsmith of Caribbean ancestry, Shirley (if her reported birth date of 1941 is accurate) was only 13 when the Chords (of "Sh-Boom" fame) committed her composition "Pretty Wild" to wax. As a singer, the Bronx-based teen won Amateur Night at the Apollo Theater in Harlem while also performing as a member of the Metronomes and getting spliced to group leader Alphonso Elliston. 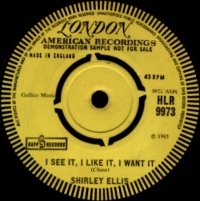 Hubby managed the Heartbreakers whose 45 "One, Two, I Love You" was a further example of Shirley's creative prowess. 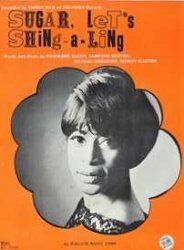 It was through a songwriting cousin of Alphonso's that Shirley forged a partnership with Lincoln Chase. 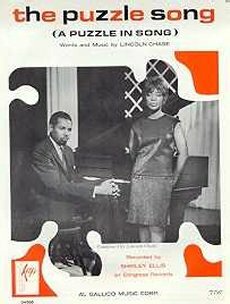 Spectacularly unsuccessful as a record star, Chase was one of the biggest writers of the 1950s, supplying stars like Chuck Willis, Big Maybelle and Ruth Brown with top of the range songs and scoring hits for the Drifters and LaVern Baker with "Such A Night" and "Jim Dandy", respectively. 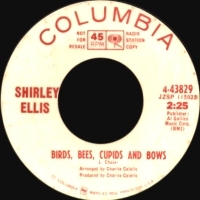 In 1959, Chase became not only Shirley's songwriting partner but also her manager and, later, her producer. The symbiosis was immediate; he saw in her the raw stuff that stars are made of, while she sensed his innate ability to mould her into one. The pair worked ceaselessly together over the following years on perfecting every aspect of her talent. 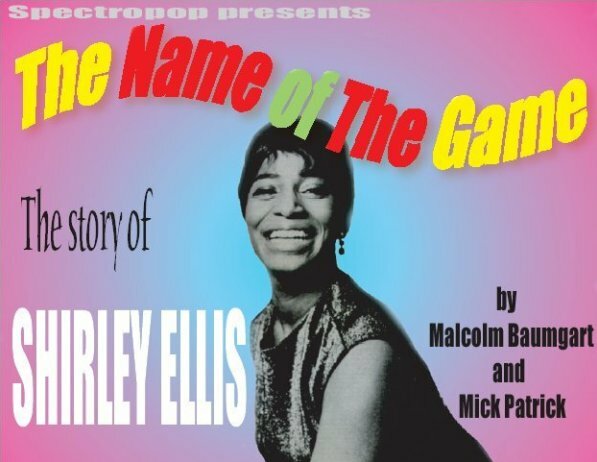 A tentative release for the small Shell logo in 1961 marked the recording bow of Shirley Elliston - nobody cared. False start. It was not until the fall of 1963 that the years of preparation paid off with the diminutive thrush's Congress label debut, the incredibly exciting "The Nitty Gritty". Taking over where Trini Lopez had left off a few months earlier with the loose, live, feel-good smash "If I Had A Hammer", Chase fashioned the hippest slice of au-go-go, street-smart madness of 1963 or any year since. 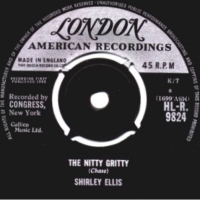 Demo copies of this George Harrison favourite read "The Real Nitty Gritty" by Shirley Elliston but the title and the singer's surname were edited for commercial release. 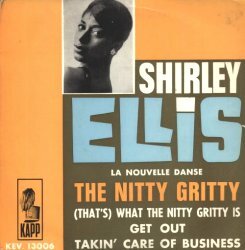 Shirley Ellis, after years of grooming, became an overnight Top 10 hitmaking sensation. Although she didn't quite explain the meaning of "The Nitty Gritty", the listener instinctively sussed that it was the unadorned kernel of reality at the heart of anything and everything. The phrase grabbed the imagination of society's mainstream and is enshrined in the common vocabulary to this day. "(That's) What The Nitty Gritty Is" was no more enlightening and, let's face it, a tad opportunistic. 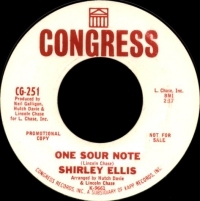 This soundalike follow-up stalled in the lower reaches of the chart and, after the no-show of the vastly superior "Takin' Care Of Business" and a "Nitty Gritty"-style revival of Chase's "Such A Night", it seemed that the Ellis bandwagon had ground to a halt. Forget it pal! 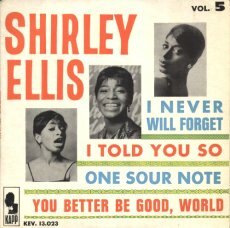 As Christmas 1964 lurched ever nearer, Shirley bounced back onto the charts with a bullet. 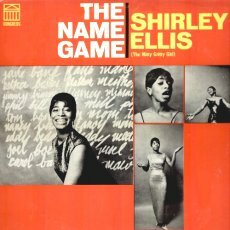 The convoluted craziness of "The Name Game" was impossible to withstand and would become the singer's biggest hit. She proved a sensation on Murray the K's Brooklyn Fox Holiday Show that winter, taking "Name Game" requests from the crowd. Let's hope that Shirley-Shirley-Bo-Birley had the sense to ignore Buck! 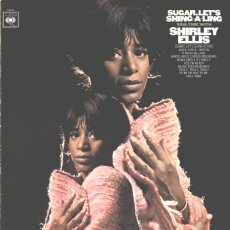 The fun kept coming as her wildly percussive follow-up began an equally impressive chart run while breaking Shirley Ellis internationally. 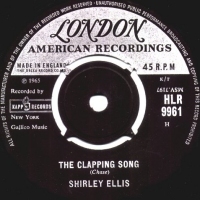 Her third Top 10 smash finally brought the star recognition in Britain and many other territories but "The Clapping Song" would prove impossible to top. 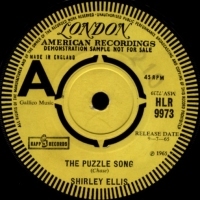 A lowly placing for the rubber-band rhythm of "The Puzzle Song" was to be the lady's last chart showing for Congress. 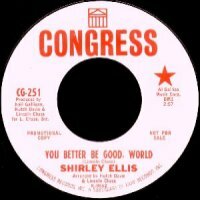 Shirley's "I Never Will Forget" stiffed as did her ominous Christmas 1965 single "You Better Be Good, World" on which reindeer quaked under threat of atomic devastation. The overly-dopey, yet curiously cherishable, "Ever See A Diver Kiss His Wife While The Bubbles Bounce About Above The Water?" erm . 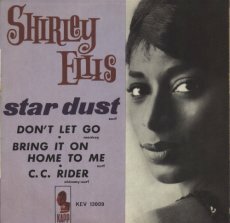 . . bubbled under the Hot 100 for five seconds in early 1966. 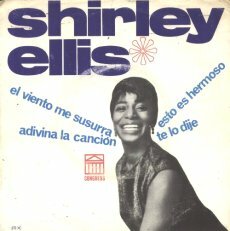 Shirley was then signed by Columbia. 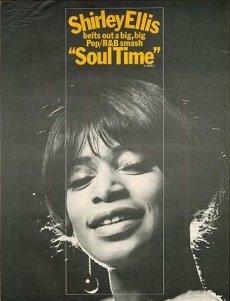 She registered her chart swan song with the memorable "Soul Time", the second of a trio of 45s for her new outlet. 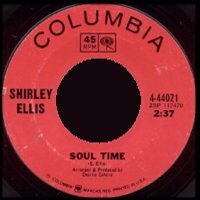 A June 1967 Columbia album, her third in all, was the last we heard from Shirley. Although she was reported to have then pacted with the Bell label, no records were forthcoming and she vanished into retirement. 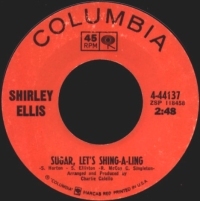 Three fondly remembered smashes is more than many more feted artists achieve and, although Shirley Ellis is one of that dignified handful who resisted the oldies circuit, her oft-revived classics continue to delight listeners the world over. All together now . . . Three-six-nine, the goose drank wine, the monkey chewed tobacco on the streetcar line; the line broke, the monkey got choked and they all went to heaven in a little row-boat!